Accomplish Quilting Inc. Advanced AutoPilot Training Program is now released! 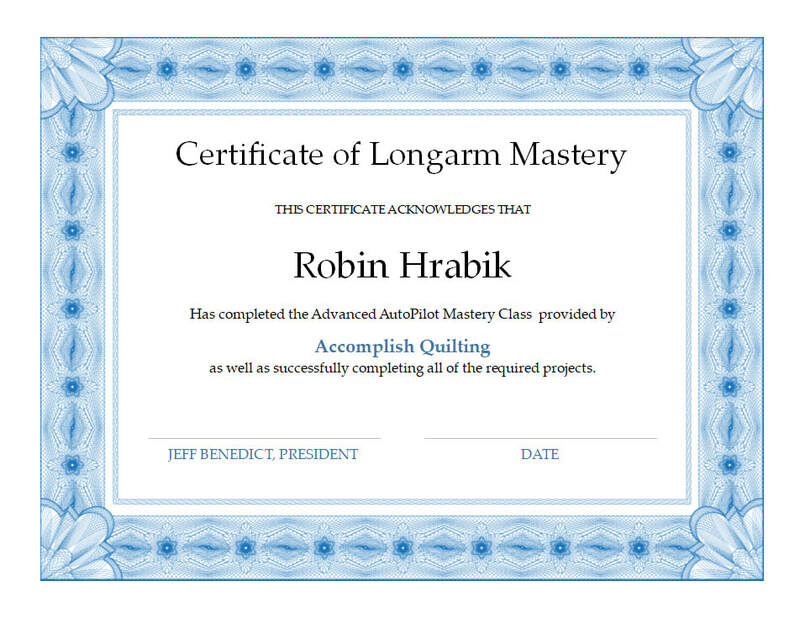 Accomplish Quilting, with its goal of having highly successful customers, has developed a comprehensive advanced training program you can flexibly use in your home to master all levels of quilting including highly custom quilting. There is nothing else like this available from any other source! Take advantage of these materials to learn to use every tool available for the Innova™ AutoPilot Mach 3 while having the ability to refer to these training materials as needed again and again! With these certifications you will be confident you know how to use this equipment to correctly place beautiful stitches anywhere you want on quilts. Announcing Accomplish Quilting's Advanced AutoPilot Training Course! Accomplish Quilting has now made learning how to use your Innova AutoPilot available to you no matter where you live! How do I become a certified AP user? With these certifications you will be confident you know how to use this equipment to correctly place beautiful stitches anywhere you want on your quilts. One fully-illustrated, 100-page workbook in full color with complete step-by-step instructions for using the AutoPilot Mach 3 system to complete 8 engaging projects with 32 exercises ranging from edge to edge to highly custom creations. The projects use every tool of the Innova AutoPilot Mach 3 so you can expand your capabilities with the step-by-step instructions. Four, one-on-one, 15 minute, on-line, technical support sessions on this training with Ruth or Rick Grihalva. Scalable: applies to all Innova AutoPilot configurations. The class connected all the “dots” of the program and finally gave me a printed reference that detailed enough so I can use my autopilot more effectively! Janet H.
Sharing time with hands at the computer was what I liked the best. Ruth and Rick were so pleasant and have a love for teaching for our success. Lisa R.
Small class, friendly people-teachers and students. Organized material: step 1, step 2 etc. Hands on the computer, layout of work, exceptional class! Amy O. The steps for each process were explained very well. Great hand out material! Very comprehensive. Amazing class. Thank you! 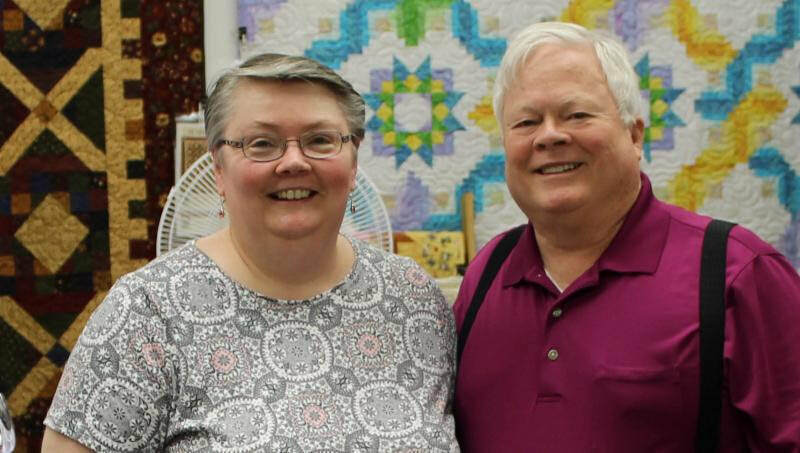 Nancy T.
You must notify Accomplish Quilting, Inc. directly if you need to cancel a quilting class by calling 1-866-556-2552 between 9:00 a.m. and 5:00 p.m. EST or by e-mail at sales@accomplishquilting.com. The amount of your refund for class cancellation is determined by the date you notify Accomplish Quilting, Inc. of your cancellation. 100% Refund if cancelled 14 days prior to class date. 50% Refund if cancelled within 7 – 13 days prior to class date. 0% Refund if cancellation or reschedule request is received less than 7 days prior to class date or in the case of “No Shows”.